Traditional braces have improved a lot. They are smaller, better engineered and machined, and more comfortable today than ever. Made of clear crystals, 24K gold plated hospital grade stainless steel, and titanium, bonded braces are the handles titanium archwires use to straighten your teeth. The wires are straight, your teeth are not. Colorful silicone elastics tie the wires to your teeth. Tying to each crooked tooth distorts the wire. 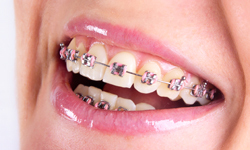 But titanium has almost perfect elastic memory and it gently teases your teeth into position.